Rabbi Ariel Fisher originally hails from New York City where he grew up and went to high school. After high school he spent a year studying at Yeshivat Maale Gilboa, an Israeli hesder yeshiva in northern Israel, where he fell in love with learning Torah, as well as hiking in the Israeli countryside. He subsequently attended the University of Pennsylvania where he majored in Urban Studies and focused on the role that religious communities play in the lives of the urban poor. At Penn he was also very involved in the Jewish community helping run and organize many programs and teaching classes in the Penn Hillel. He also was involved in initiating various Muslim-Jewish dialogue programs. As a naturally curious person, Rabbi Fisher spent lots of time exploring different neighborhoods of Philadelphia on his bike, and meeting all types of interesting and strange people. 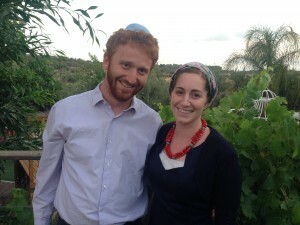 After graduating from college Rabbi Fisher moved to Israel where he has been for the past four years, first back at Maale Gilboa and subsequently at Yeshivat Machanayim. Rabbi Fisher received his semicha from Rav Shlomo Riskin and Rav Zalman Nechemia Goldberg and has also been studying for the semicha from the Israeli Rabbinate. In the past two years he has also been working as the program coordinator for Yeshivat Darkaynu, a special-needs program in Yeshivat Har Etzion. In his free time he enjoys mountain biking in the hills of Jerusalem, catching up on the latest issue of the New Yorker, listening to Jazz, and cooking. Bina Brody was born and raised in Jerusalem to American parents who made Aliyah ten years before she was born. She grew up speaking Hebrew and English but has always had a love of languages which eventually led her to studying linguistics for her BA at the Hebrew University. In addition to a year of sheirut leumi (national service) working in a poor community in Israel’s north, Bina also spent two years in the army as a basic-training commander for soldiers that came from disadvantaged homes. She has also spent many years studying at various midrashot (institutions of higher learning for women) in Jerusalem, including Midreshet Lindenbaum, where she spent three years, and Matan, where she is finishing up her second year in the Advanced Talmud program. In addition, Bina is pursuing a PhD from the University of Pennsylvania in Anthropology and Enthnomusicology and has a passion for music and especially African music, a passion which developed when she spent almost a year traveling across the continent by herself. She is excited to move to America and is particularly excited about being able to teach Talmud and Midrash to the students at Princeton.